We typically view the world through lenses but usually don’t examine the lenses themselves. From time to time we need to check our glasses to see if they are filtering the world cleanly or are distorting our vision. 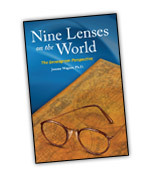 Nine Lenses on the World: the Enneagram Perspective provides a lens check to find nine clarifying lenses and discover how those filters may come to distort our worldview. Our paradigms or schemas can be pliant and adapt to new circumstances or they may be rigid and force reality into our familiar patterns. We may either stay with our old lens prescriptions or we can upgrade our mental software. The Enneagram gives us direction and provides us with nine useful perspectives for viewing the world. Click on the image to the left to order Nine Lenses on the World. Intended for a general audience, this thorough yet brief guide through the Enneagram system provides a clear common sense outline of each of the nine styles. The resourceful characteristics and ideals of each style are contrasted with their non-resourceful idealizations. For example the Good Person's passion for excellence can become a maladaptive pursuit of perfectionism. The adaptive energy, or virtue, of each style is contrasted with its maladaptive energy, or vice. What each style avoids and how they avoid it through specific defense mechanisms are detailed. How the distortion of each style may have developed and what each style misses because of its distortions are described. And the intrapsychic and interpersonal shifts that occur under relaxed and stressful circumstances are spelled out. 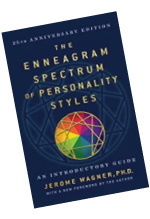 Click on the image to order the Enneagram Spectrum of Personality Styles.